Save time and expense by creating real-time collaborative meetings with the RICOH Interactive Whiteboard D5510. Standard viewing options allow up to 20 users to view a whiteboard presentation on web-connected devices. 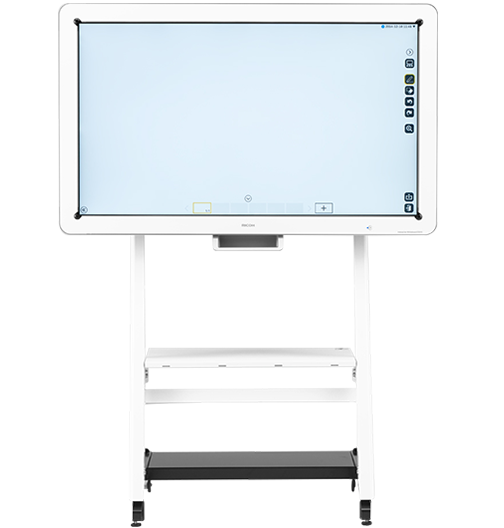 With the optional software license, you can connect up to 20 whiteboards simultaneously in multiple locations. It's a fast, easy and cost-effective way to gather faraway participants virtually. Set up is fast and easy. Simply connect the D5510 to your PC, tablet or mobile device, and follow the prompts to get started. Navigation includes icons which mirror everyday business applications, so it's easy to fine-tune system controls and manage presentations with minimal searching and effort. Maximize your meeting time and collaborate with your team interactively, onsite or off. Make changes using the whiteboard tools to write, draw, edit, resize, move and save information easily. Plus, connected interactive whiteboards are common space - what's added to one board will appear on all networked boards. All you have to do is choose the participants and decide how you want your information to be displayed. Connect the smart whiteboard to a projector and showcase your presentations to larger audiences. Link it to other remote whiteboards. Use it as a high-quality display using an optional video conferencing system . Or simply invite remote viewers to join and view your meeting using PC, tablet or smartphone- how they connect is up to you. Keep presentations private via log-in pin-code authorization. Afterward, save the presentation as a searchable PDF file - including handwritten notes - to a USB drive, network shared directory or even temporarily on the board's solid state drive. To secure your presentation, data is erased the moment you shut off the interactive whiteboard. Or, simply name and password protect the document at the whiteboard, and then email it directly from the board to participants.